Our beautifully presented, spacious, modern, second floor, three bedroom apartment has air-conditioning, a very well equipped kitchen with washer dryer and dishwasher, two bathrooms (1 en suite), a cool tranquil sitting/dining room with balcony and satellite TV with all the general British digital channels, pay as you go wifi, a very large roof terrace for barbeques and relaxed outdoor dining, as well as a pleasant communal garden. The lift from garage to roof terrace makes it very accessible and we are able to offer secure garage parking for one car or storage space for bikes etc. There is also ample parking outside the apartment for additional vehicles. Tavira’s picturesque historic centre is only a 10 minute stroll. We are close to all amenities including shops, supermarkets, coffee shops, restaurants, cinema, banks & railway station. Great location for beautiful blue flag beaches and the Ria Formosa nature reserve. Only thirty minutes from Faro Airport on the A22, within easy reach of Spanish border. We took on the apartment without really knowing too much about the region, though it was recommended by friends who had been living there for some time. We have not been disappointed! Tavira is a beautiful old town with a thriving cultural scene and great cafe style living. Regular flights from the UK to Faro make it a great holiday destination and the weather generally guarantees you a long season. We visit as often as we can and we have made the apartment a home from home for us and our three daughters. We've built up a regular customer following with several of our guests returning year on year. We love the area for its convenience - half an hour from Faro airport and with good rail links for those who like to travel independently. We love the cafe life in the town centre, the musical events and weekly craft and antique markets in the summer and the fabulous restaurants serving great local produce. Tavira has a real cosmopolitan buzz and the people are very welcoming and friendly. Some of the most beautiful beaches are located nearby and there's plenty to see and do throughout the year. We've tried to make it a home from home and generally act on recommendations from guests to improve our service if they request anything additional. There's air conditioning, UK TV channels, pay as you go wifi and a great roof terrace with a barbeque and sunshade for when it get s really hot! Older guests say that they like the fact that there is a lift to all levels including the roof, so if you do have a mobility problem you can still enjoy the sunshine on the terrace! You can be in town within 5 minutes on foot - passing trees laden with figs and olives. En-suite bathroom to bedroom 1 with shower cubicle, sink and vanity unit with large mirror over and wc. Large family bathroom with bath with shower over, sink with vanity unit and large mirror, bidet and wc. The apartment is fully air conditioned and the temperature in each room can be controlled with individual room remote controls. Bed linen provided based on number of guests and duration of stay. Gas fireplace in living room (not used much by guests as you can have the air conditioning set to heat). Secure garage space available for one vehicle. We have Vodaphone pay-as-you-go internet for which you can purchase a card locally (our agent can help you with this). Bath and hand towels provided per guest. We do not provide beach towels. L shaped leather sofa (converts to sofa bed for occasional use), TV and DVD player. Extending dining table (seats 8) and 6 dining chairs. Living flame gas fire. Small balcony to the front. Living room is air-conditioned. Place settings for six people with some spares. Saucepans and oven trays etc all available. Fitted kitchen with integrated appliances to include fridge freezer, electric oven/gas hob with extractor hood, washer/tumble dryer and dishwasher. Microwave, table and four chairs, kettle, toaster, iron and ironing board, vacuum cleaner. We have a small breakfast table to seat 4 people in the kitchen and a large extendable dining table in the dining area of the living room that seats up to 8 people. Balcony to the front of the building accessed from the sitting room. Rear balcony accessed from master bedroom. Large roof terrace with sun shade, sun beds, table and chairs. Tavira is a popular place for golfers as it is within easy reach of five quality golf courses - Benamor (the closest) Castro Marim, Colina Verde, Quinta de Cima and Quinta de Ria. You can access the apartment via the lift from the garage entrance. The apartment itself is all on one level so people with mobility problems can access the rooms reasonably easily. Balcony access is not possible in a wheelchair but the roof terrace can be accessed via the lift. Notes on accommodation: Our apartment is non smoking and unfortunately we don't allow pets. The air-conditioning units can be set to heat rooms in the colder months. Outside: We enjoy the largest roof terrace in the condominium which overlooks the communal garden to the rear of the building. It's a fabulous place to sunbathe and relax in the glorious Portuguese sunshine! Well equipped, we can provide you with five sun loungers, a table and 2 director's chairs, 3 white garden chairs, 2 deck chairs, a sun sail and a barbecue all for your exclusive use. The front balcony is great for watching the world go by in the evening shade and the rear balcony a bright sunny spot for taking your early morning coffee and reading the newspaper! Close to the apartment is a small children's playground. Cleaning / Towels / Linen / Maid service: Towels and bedlinen are provided for the duration of your stay (guests must provide their own beach towels). The apartment is cleaned prior to arrival and on departure. Fantastic large air-conditioned apartment. Great location. Good parking. Just a 10 minute or so walk to lots of excellent restaurants and bars in town. Perfect. My third visit to Tavira , the apartment was in a great location, easy access to supermarkets , bus station and town. Apartment was clean and very spacious. Great communication with owner. I would recommend this apartment. Casa muito bem equipada e climatizada. Muito próximo do centro . A menos de 1km do LIDL e Pingo Doce. Supermercado muito perto,lidl,Aldi,pingo doce,continente. Internet movel carregada com 30gb. Apenas referir q a limpeza do apartamento antes de o usarmos, falo do chão e do frigorífico, (tudo o resto estava lavadinho,lençóis, toalhas de banho) estava muito mal feita. Limpei o frigorífico todo antes de o usar e toda a loiça q usamos tb foi limpa antes. Tv apenas com canais estrangeiros. Appartement conforme à l'annonce et accueil parfait de la part de Dan. Situé à 5 mn à pied de la ville et 10 du bateau qui vous mènera sur les plages de l ilha formosa ( plage non accessibles directement sans prendre la bateau). Appartement confortable ( pour les habitués des lits bultex en mousse se sont des matelas à ressorts qui peuvent ne pas convenir à certains). Pour le reste l appartement est très bien équipé et la climatisation appréciée à certains moments de la journée. Parking dans la rue ou privé en sous sol . Une très belle expérience. Une partie terrasse privative sur les toits dont nous n avons pas profité qui permet de faire des barbecues. Merci Dan! The nearest beaches, all of which have the coveted EEC Blue Flag status are great for families and couples alike. There's gently sloping soft sand and allegedly some of the warmest water in the Algarve! Beaches on the Isla de Tavira and can be reached by ferry (around 2 euros return) or water taxi. It is a 10 minute walk to the ferry stop through town. If you are driving or taking a taxi then Barril Beach at Santa Luzia, Cabanas, Manta Rota and Praia Verde beaches are worth a visit. 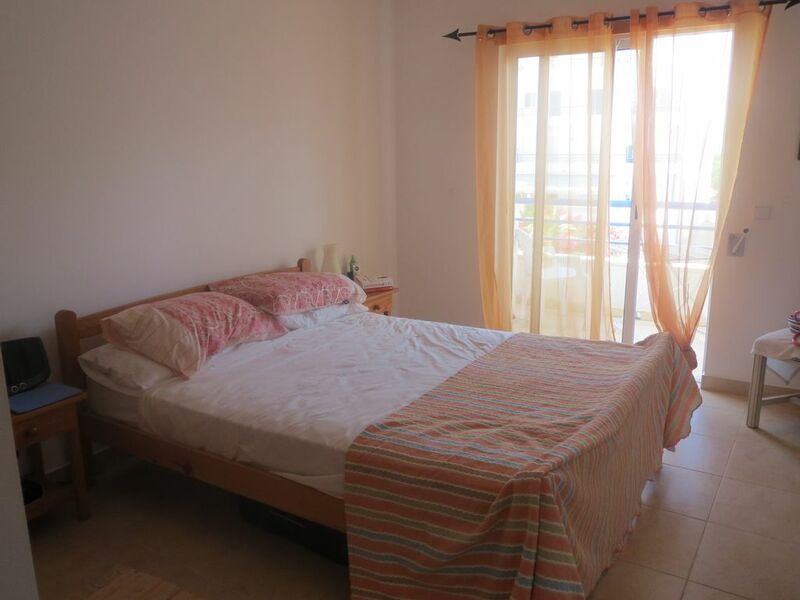 The apartment is approximately 30 mins drive from Faro Airport on the A22 - a relatively easy journey. There are several car hire companies with collection available at Faro Airport. Taxis from the airport to Tavira cost around 45 euros or you could take a taxi to Faro railway station and get a train. There's also a shuttle bus service from Faro to Tavira which costs around 8 euros per person. We can advise on car hire and can help with booking taxi /shuttle transfers - please ask when booking. A gentle stroll along the cobbled streets into the centre of Tavira with it's churches, a castle, camera obscura and the river Gilao takes around 10 minutes. The nearest beach is a 10 minute ferry ride from the centre of town. The Western Algarve is around 45 minutes away on the motorway as are fabulous family water parks such as Zoo Marine and Aqua land. You can be at the Spanish border in 40 minutes on the train. Tavira is a beautiful town which has carefully blended the modern with the old. There are many niche shops, cafes and restaurants serving delicious and inexpensive locally sourced food and others serving as outlets for local artists' products. There are plenty of banks and cash points, a post office, supermarkets (Aldi, Lidl and Pingu Doce) for those who want to self-cater and great food, antiques and bric a brac markets close by. In the summer months you can stroll along the river and enjoy the communal entertainment in the town square. The irish bar on the riverside also regularly hosts live bands. The train service is cheap and reliable if you want to travel by public transport along the coast. Booking Notes: Please check availability before booking any flight. There is a 25% deposit payable at time of booking with the balance due 4 weeks before the holiday. We require a refundable damage deposit of £100 which needs to be paid with the final balance and will be refunded within 2 weeks of your return. Checking in time 15.00 hrs and checking out requested by 10.00 hrs though we can be flexible by prior arrangement. For further enquiries and to confirm availability please contact the owner. Changeover Day: Changeover days are flexible. Please contact the owner to agree before booking. Notes on prices: Prices are for the property per week in UK Pounds for 2 adults sharing. For parties of more than 2 adults contact the owner to confirm cost. Reduced rates are available for long term lets - please contact the owner for further details.